First of all I will let you know that I probably love candy more than the next person. I have an abnormally massive sweet tooth. I could eat candy all day errrryyyday and I’m sure there have been days where I have. But of all the candies in the world, chocolate is usually my sweet treat of choice. Sadly, there are some major problems with the chocolate industry, which include forced labor, human trafficking, and child slavery. If you would like to learn a little more you can watch a documentary called The Dark Side of Chocolate that came out in 2010. More recently there has been a social movement towards fair trade certified chocolate, which ensure that the chocolate is produced in an ethical manner. And that is precisely what Madécasse (pronounced MAH-DAY-KAS) does. 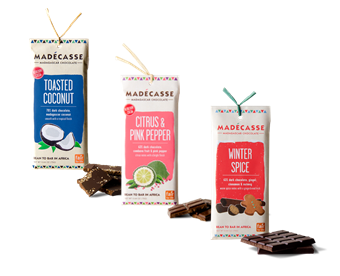 The founders claim that by keeping all of the production within Madagascar, their products create 4 times the economic impact than other fair trade chocolate producers. Great stuff, right?!? Now let’s get to the fun part, how does the chocolate taste? I tried the Toasted Coconut on a whim. I’m normally not a huge fan of coconut (unless it is on my Caramel Delight Girl Scout cookies) and I must say I was pleasantly surprised! The bitter dark chocolate and the sweet coconut really create a great combination. I’ve seen this chocolate at my local Hannaford and Shaws, but it wouldn’t surprise me if it were sold at other grocery stores. The chocolate is a little pricey at around $6 per bar, but definitely worth it for the occasional treat or possibly a gift. If you can’t seem to find them in store or find a flavor you like, you can order the chocolate from their website. There are a bunch of cool flavors! To me the Citrus and Winter Spice both sound amazing and I hope to try them soon! What chocolates sound good to you? Categories: Uncategorized | Tags: Africa, candy, chocolate, delicious, fair trade, Food, Madécasse | Permalink.